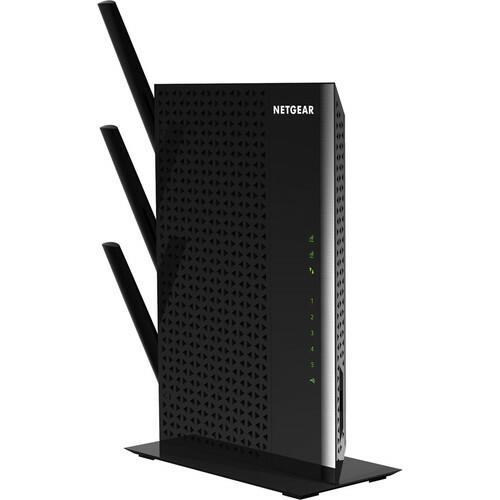 With enhanced 802.11ac Wi-Fi technology, the EX7000 AC1900 Nighthawk Wi-Fi Range Extender from NETGEAR supports wireless data transfer rates of up to 1900Mbps. In addition to 802.11ac technology, this range extender also supports 802.11a/b/g/n networking standards so you can connect nearly any Wi-Fi enabled device to the network. With dual band functionality, you can allocate tasks such as email and web browsing to the 2.4GHz frequency leaving the less congested 5GHz frequency for more bandwidth intensive jobs such as streaming multimedia content, gaming, and more. The EX7000 sports three external antennas for maximum wireless coverage as well as five Gigabit Ethernet ports for a range of network connection options. You can even connect USB compatible peripherals such as hard drives and printers to your network via the integrated USB 3.0 port located on the back of the range extender. Box Dimensions (LxWxH) 12.3 x 10.2 x 3.3"
EX7000 AC1900 Nighthawk Wi-Fi Range Extender is rated 4.0 out of 5 by 4. Rated 5 out of 5 by Rocky J from EX7000 Solved Wireless Problems I ordered this extender to replace the Netgear N300 I had been using. Even though I live in a one-bedroom apartment, the 300 wasn't doing the job reaching from the router in the living room to the second computer in the bedroom. Maybe there are just too many walls in the way. As soon as I set up the EX7000, problem solved. Streaming is now no problem, with no buffering bagels, and websites come up quickly. I had no problem doing the setup. Highly recommended. Rated 5 out of 5 by Anonymous from This is a great Wi-Fi range extender. Easy to setup! I needed to extend my two band modem. The Netgear install program video and easy web page setup got the whole install up and running in a very short time. Rated 5 out of 5 by Wayneh from Outstanding Choice!! I am using the Netgear Nighthawk WiFi Range Extender to my Asus RT-AC68U router. Set up was was simple. Unpack the the unit, screw on the three antennas, plug into wall outlet, push WPS on the Nighthawk followed by WPS on my router and the two units connected at the 2.4 band. Repeated the simple sequence to connect the 5 Ghz band. The unit is worked flawlessly since initial set up. The WiFi signal strength is amazing on both bands, easily covering our 4,000 sq ft home with max signal strength. I'm living in a rv park as I move around. The park has WiFi, what product is good for picking up their signal and boast it.and send the wifi signal to wifi printers laptops iPads and smart tv's all wireless? This has the potential to be a very easy solution, or complicated. To make that determination we would need some additional information. Please send an e-mail to askbh@&lt;a href= http://bhphotovideo.com target= _blank &gt;bhphotovideo.com&lt;/a&gt; and we will be better able to assist you. What is the transfer speeds? The speed you'll get out of the EX7000 depends very much on building layout &amp; construction and how you've configured the device. My experience is that the extended network's speed is highly sensitive to small changes in the position of the EX7000 and the orientation of its 3 antennas, as well as the location of the client device. I've got the the EX7000 positioned about 6 feet from the primary wi-fi router, on the other side of a brick wall. It repeats both 2.4 &amp; 5 GHz and is set to maximum power. Using a speed test app on my iPhone (measures the speed between the phone and an external speed test server), here are upload/ download speeds at various locations around the building. The baseline is 52 Mbps up &amp; down directly through the primary wi-fi router. Upstairs, 60 - 80 feet from the EX7000, with a brick wall or two in between, download varies from 52 Mbps down to 33 Mbps, and upload 23 to 32 Mbps depending on location in the room. Downstairs, about 100 - 120 feet away and though 4 brick walls, I get a download speed of 10 and upload of 3 Mbps.I haven't ever tried measuring purely local LAN speeds because we just don't have much local traffic.